Brandon Morris scored a career-high 17 points, including nine in the last 3:15, to lead the Georgia Bulldogs over the Lipscomb Bison 84-75 on Saturday. The win was the third in a row for the Bulldogs and improves their overall record to 4-4 on the season. Charles Mann, Georgia’s starting point guard, did not play due to a nagging leg injury. Walk-on Taylor Echols, who had only played 37 minutes for the Bulldogs in his career, played 23 minutes and scored nine points. He also added three rebounds, four assists, and two steals. 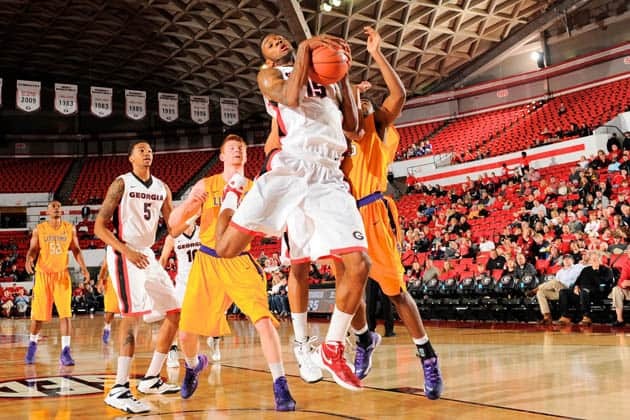 Brandon Morris was the leading scorer for Georgia with 17, and he also had four rebounds, three assists, a steal, and two blocked shots. Overall, nine Bulldogs scored in the game. Others to score were Nemanja Djurisic (15), Donte Williams (14), Kenny Gaines (11), Juwan Parker (7), Cameron Forte (4), Tim Dixon (4), and Marcus Thornton (3). Georgia led Lipscomb 40-27 at the half, but had to survive a late rally to hold off the Bison. With 14:19 left in the game, Georgia went on a 9-0 run to take a 54-35 lead. But Lipscomb countered with a 24-9 run behind six three-point field goals. The Bison would only get as close as four points before the Bulldogs pulled away for the final time. The Hoop Dawgs finished the game shooting 57.4% and 50% from three-point range. Free-throw shooting woes continued though, as UGA only hit 13-of-22 (59.1%). Georgia’s next game is at home on Thursday, Dec. 19 vs. Gardner-Webb. The game will be broadcast via GTV at 11:30 a.m. ET.